Haze Mabry has much to teach us when it comes to leading a happy life. A few days ago this story by Allison Klein, editor of Washington Post’s Inspired Life, appeared there and has since gone viral. “Haze Mabry”, writes Klein, “who works as a janitor at an elementary school in Georgia, walks into the building every day and empties trash cans, wipes down bathrooms and mops wet messes in the hallways. 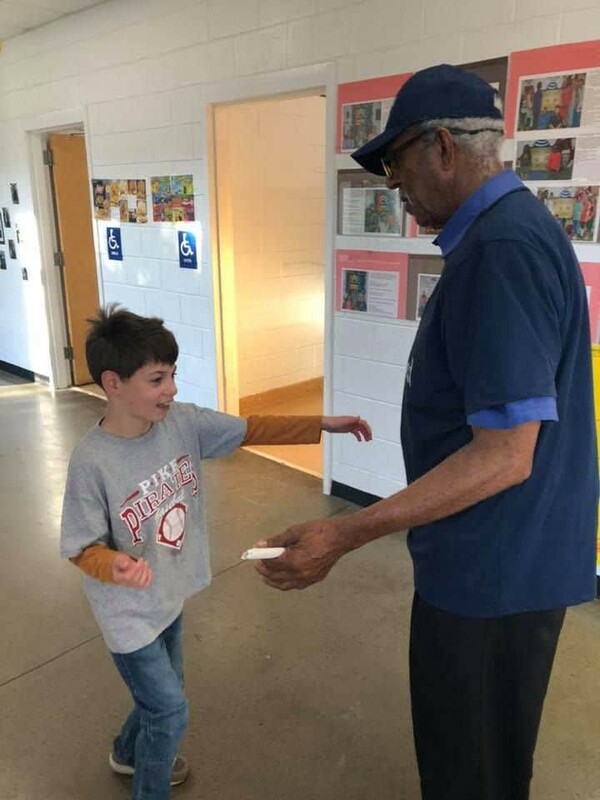 Last week, after he arrived at Pike County Elementary, instead of finding garbage to clean up, he found almost 800 students lining the hallways with handmade cards and banners, blowing noisemakers and singing a full-throated happy birthday to him. It was his 80th. The students chanted “Mr. Haze! Mr. Haze!” as he walked the long corridor, and some spontaneously popped out of line to hug him”. Haze Mabry has found a way to be happy where he is. He isn’t postponing the good feeling of love and caring for a day in his life that looks perfect. Rather he is engaged in what he has turned into, a profoundly meaningful and purposeful work life, being a janitor in an elementary school. Simply put, he is a very important part of the day for hundreds of little children who feel they can come to him with a problem, ask for a hug, a high five or a little love. As a psychologist, I am amazed and moved to see how closely Haze Mabry’s life is to the studies on what makes people happy. I will let the reader connect to Klein’s full story below, but I can’t resist commenting on a few of the high points from a research point of view.The quotes below are all from Klein’s article in The Washington Post. As exemplified in them, Mr Mabry hits some of the top 9 in terms of happiness. 2. He is capable of giving love, he is not waiting for it, he’s a love generator. Relationships are connected in the research to everything from physical and emotional health to longevity, they are happiness hack numero uno. Enjoy the people around you. 3. He has purposeful action, he moves his body. Moving your body allows the physiological mood regulating chemicals like serotonin to flow. “Use it or lose it” is the chant in terms of keeping physical health, flexibility and balance as you move along in years. 4. He has a sense of humor, he has imagination and he’s not stuck in a role, not stereotyped, “Im like the old lady in the shoe” WOW, go Mr. Mabry. Laughter is cleansing for both the brain and the body and it resets us if we’re out of balance, particularily a good belly laugh. Did he feel like a celebrity? No. Did he feel special? No. He said he felt loved. 5. He can accept care and support from others which is not only part of resolving trauma, as trauma makes you freeze up, shut down and isolate, it is part of feeling alive and connected to something bigger than ourselves. 6. He dances (whether or not it’s ‘good’. Dance, too is an age old method of resolving trauma and moving painful feelings through the body, it is also an age old form of the celebration of life. He is in a long term committed relationship. Research says he’ll live longer and better. “Mabry, one of nine siblings who grew up picking cotton and peppers not far from the school, has been the janitor at Pike County Elementary for 13 years. The school recently hired someone to help him, but that person works a shorter schedule. Mabry arrives at 6:30 a.m. and doesn’t leave until 5:30 p.m”. 7. He is humble and hardworking. “No I cannot floss” who cares, floss anyway. The important thing is not how well you sing or dance or even love, it is that you sing and dance and love.He is committed. “Over the weekend, he said, he was still working through the piles of homemade cards at his house. He wanted to be sure to read each one.One card from a student stood out to him. It read: “Mr. Haze, you are my sunshine.”……“I feel the same way about them,” he said. 9. He has what researchers call “heart coherence” which will emanate to all of the organs of his body. He can recall a pleasant moment over and over and over again and experience pleasure. Haze Mabry can see and create meaning and purpose in the life he has.He is not on a constant search for some elusive happiness that is “out there”, he is finding it where he is standing, he is the one bringing the meaning. He is creating his own happiness. What an inspiring story, thanks so much Tian for sharing it here! Haze is kindness and dharma (service) personified. May his sunshine continue to emit those rays of life, so that those students carry his message into their future lives. He is such an inspiration, shows how every day in small ways we can make a Big Difference. Thanks Carey, I also find him so inspiring, he literally ticks all the boxes from a research point of view, and is obviously a man with such depth and heart who means the world to these kids. I also think I like it because I am so aware of the limitations of assigning the "healing" role to professionals, I think this man touches peoples lives every day and knows how much he can make a difference. In the 1950s when I grew up we used to say "reach out your arm and take care of everything in that radius," if you really want the world to be a better place. I love this post so much! Thanks for sharing, Tian. It is sunshine! Such life lessons teach us that society’s ideas of what makes a person rich and successful are so off base, as are the measures many use to say whether our country is successful or not: Gross Domestic Product vs. the sense of health, well-being, and happiness of our people.